Mels Box of Chocolates: Sticker Stamps? Zoe came running out from the den/office/playroom the other day saying, "Look mommy, look at these cool stickers I found." When I looked, I had to laugh, "Those aren't stickers, their stamps. Stamps cost money so let's not stick them everywhere, ok?" Then it came. The question. "What's a stamp?" she asked. My daughter had no idea what a stamp was. I realized that she had never used a stamp. Growing up I would write letters to my grandparents and mail them all the time. Now Zoe and Dylan email their grandparents or call them on their cells (Zoe is quite good at that!) since there isn't long distance charges. I would often watch my parents pay the bills, add the stamp, and put them in the mailbox to send them on their way. My kids know that when I have the stack of envelopes beside me and I'm grumbling at the computer, I'm paying the bills. When Christmas rolled around, I would help mom add the Christmas stamps to all the Christmas cards. Now we take the picture, put it on the blog, Facebook, and an email along with a Christmas greeting and call it a day. Of course, she didn't know what a stamp was because she doesn't use them or see me using them. Matter-of-fact the ones she discovered were the 2 cent ones that I must have used at some point to adjust the price going up. Honestly, I can't remember the last time I did buy stamps. I couldn't even tell you how much they cost. 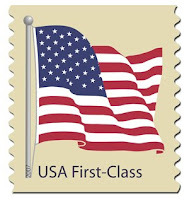 Maybe it is time to take a field trip to the post office and purchase some stamps. I can enlighten my children on the good ol' days. You know before there was the email, no long distance phone plans, blogs, and Facebook. You know, way back then. So who wants a letter? I just have to ask, do you use stamps regularly? If so, what for? I use stamps for our Christmas cards. My 9yo has written a few letters and mails them. She loves receiving letters in the mail so she sends in hopes of a reply. Bet your children will love a post office trip and a mailing! For me, I found it funny explaining a busy signal. I send Christmas cards, and I do have an occasional bill that goes out in the mail. I've also been trying to send more cards and letters throughout the year. we're one of the few still making use of the usps. my bank manager actually laughed when I said we still paid our bills via checks. oh well, at least we know where everything is, does he? Our homeschool group recently went on a tour of the post office. DD & I didn't go, but the others said it was great. Perhaps you could set up one for your class and bring Zoe too? I have the funniest story about "sticker" stamps. One Christmas, I didn't like the stamps so I bought a whole page of those pretty frog stamps that come on a page that looks like a picture but they are real stamps. My mother-in-law was babysitting and used them with my daughter to fill a notebook with "pretty stickers" all the while wondering about the little numbers on all of them (like the amount the stamp was worth). All my Christmas card stamps - spent on entertaining my child. Not too bad an investment but I was in shock at first. P.S. Glad you enjoyed the circus! But your post made me think of writing letters to my husband when he was on deployment back in the day. I would write him every day! I use stamps for some bills, b-day cards, Christmas cards. other than that they don't get used.